…..the words have been going around in my mind and nagging me for weeks. I know that I should ‘stop and stare’ but somehow the to-do lists win more times than not. The autumn is always such a busy time in the kitchen garden….gathering harvests, digging, sowing, dismantling structures, cleaning, storing……and copious hours spent in the kitchen ‘processing’ all the bounty….all this combined with work, family etc ad infinitum and it can feel like I am forever chasing my own worn out tail. 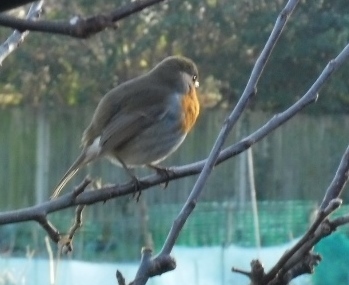 …..but then a moment comes, unplanned, when I find myself sitting still for a second outside my shed…..doing nothing, staring, without a thought, out over my veggies. It is a wonderful feeling and as I become conscious of it I allow it to grow. I allow my senses to breathe and come back to life. My eyes are the first to engage; with the colours all around me, with the changing light, in noticing the birds chancing their luck for worms in the freshly turned soil. As I watch and look my ears, too, tune in; there are squirrels chattering in the elderberry tree behind the shed, the gas is gently hissing on the stove…..somewhere, a little further away, someone is playing piano. I close my eyes and let my ears do the seeing….I can feel the weak autumn sun on my cheeks, the faintest of breezes catches a few whisps of hair that have escaped their grips…. ….and then the smells come. Damp leaves, damp soil…rich, dark brown smells. A whiff of wood smoke and with it myriad memories of my grandparent’s place. I am transported and my to-do lists are a million miles away. These moments on the plot are as precious to me as any of the veg I grow. I should make more time for them…..
Let us all put away our lists…..just for a moment……and stare. The gate. It’s a big old thing; heavy, creaking, clunky……it swings open reluctantly and bangs shut with a dull thud. Fortified with a chain heavier than anything Jacob Marley could ever manage to shake and clank. The paint is peeling, the hinges are rusting…..it blends perfectly into its sprawling, decaying urban surroundings and hardly warr ants a second glance. But it is a magic gate. This gate has the power to transform those who pass through it and reward them with moments of pure bliss and joy. Every time I step through this gate I feel the scrunch in my shoulders loosen, my head is carried a little higher, my stride softens and slows, the frown on my brow disappears as surely as if it had been botoxed, I breathe……deeply. It is a Wizard of Oz moment…..stepping from black and white into blazing technicolour. Life outside the gate is so often played in black and white – we all have it; the pressures of work and money, family life, juggling time, health issues, all the nitty-gritty, grind down stuff…….but on the other side of the gate the black and white, if only for a brief moment, disappears and we have roses in our cheeks again. Sometimes, as I try to fall asleep after a particularly hard day, I picture myself opening the gate and walking through…. Your kitchen garden may not have a gate….a big, old, clunky gate like mine……but I’m sure whatever threshold you cross you, too, step into colour. In my kitchen garden I am still the same old me……but a better me. In the kitchen garden I am me in glorious technicolour. Growing veggies rewinds me back to being a giddy 6 year old. 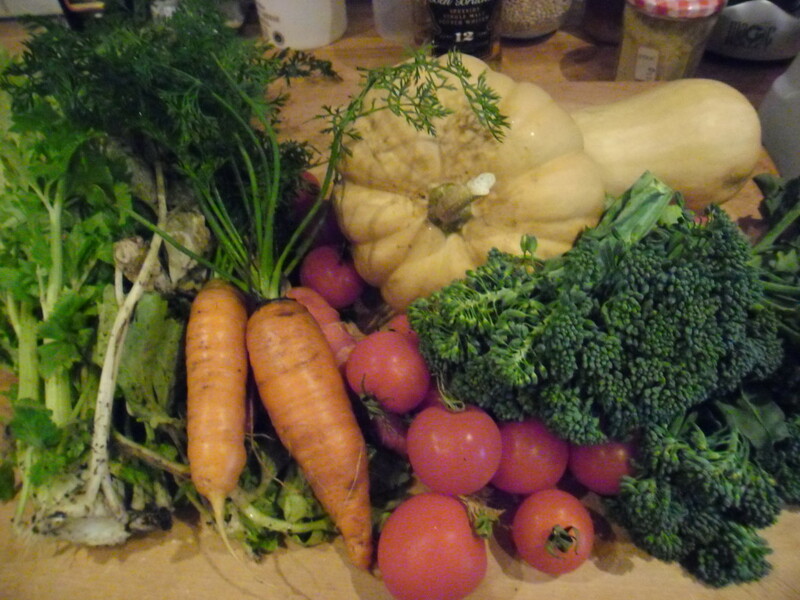 I marvel at, and become overly excited by, the sight of plants producing big, fat veggies. That teeny, tiny seed I saved from last year and sowed this year has turned into a monster plant laden with…….and here’s the exciting bit….stuff that I can actually eat! The most childishly joyful part of veg growing though is, surely, the unearthing of our root crops. We never know quite how well (or badly) they have done until we pull them or dig them out of their earthy beds. Carrots and parsnips invariably draw giggles as they come out of the ground in all their misshapen, sometimes naughtily so, glory….and there will always be the prize parsnip, longer than anything we’ve ever grown before, which cannot be eaten until at least half of our friends, family, facebook pals have had a chance to marvel at it’s size….. But the best, the absolute best, is doing a ‘pirate’…..(fancy dress is not obligatory but does help)……when we go digging for buried treasure. Except the treasure isn’t gold but, rather, potatoes. I will never ever cease to be made a bit giddy by this act. Where to place the fork? Too near and you may spear them…….too far and you may miss them….. The act is best performed after a few dry days….but, heck, never mind waiting there’s treasure to be found. All potato digging should be done with a pirate accent. Arrrrrrrr. 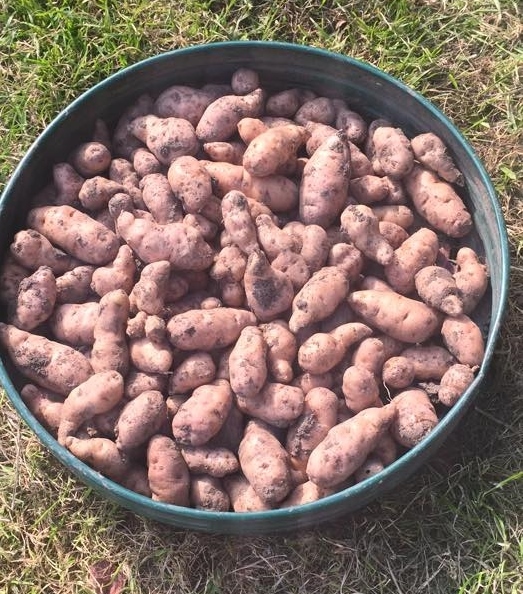 Weeks later, the now idle potato bed is ready to be dug over and sown with winter green manure……..but wait……..the treasure still comes….clearing the beds for autumn/winter sowing and revealing yet more of these little treasures I can’t help but let out little squeals of piratic joy. Being on the plot makes me a kid……being on the plot makes me a pirate. Let the squeals of childish joy ring out. Remove/compost plants which have stopped producing. 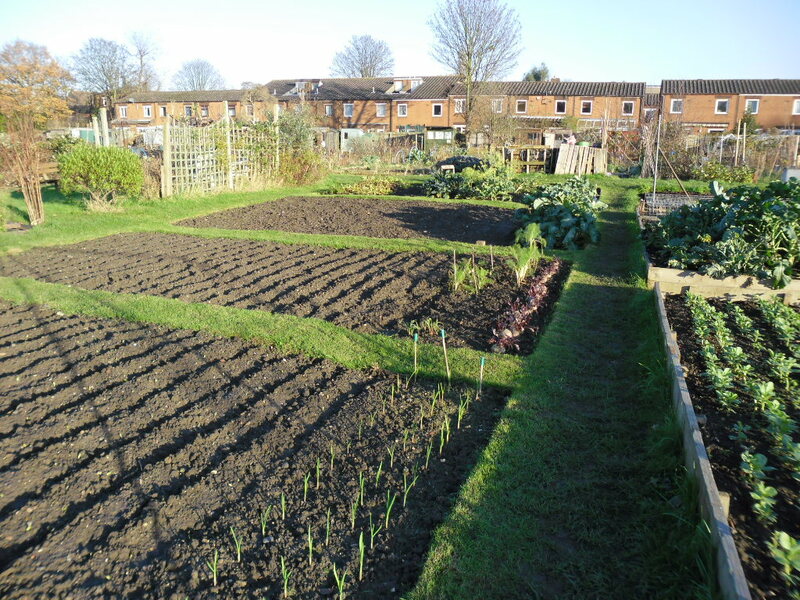 Prepare empty beds for sowing of green manures. Continue to harvest (leave enough time to cook/bottle/store). Prepare spaces for storing/get bottling equipment ready. Check winter crops for disease/pest damage etc and remove/burn diseased plants if any. 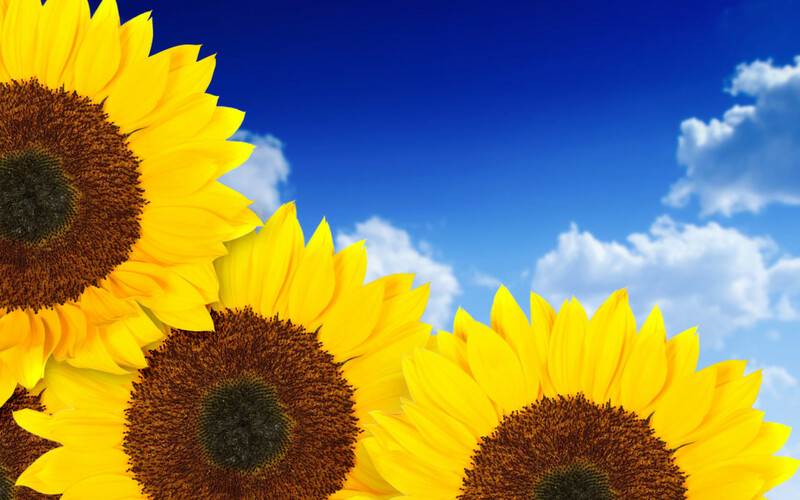 Dead head flowers to prolong/start gathering seed from those gone over. Clean bean poles/other supports ready for storing. This year I have been trying to cut down on my consumption of plastic. One of the first places I looked to do this was my ‘under-the-sink’ cupboard…..it wasn’t overly full of bottles and products but was definitely an area I could improve on in my little green battle…..it wasn’t just about the plastic (though that was the primary concern) but also the amount of ingredients in all those bottles……I have a science degree but didn’t understand half of what the labels were saying. 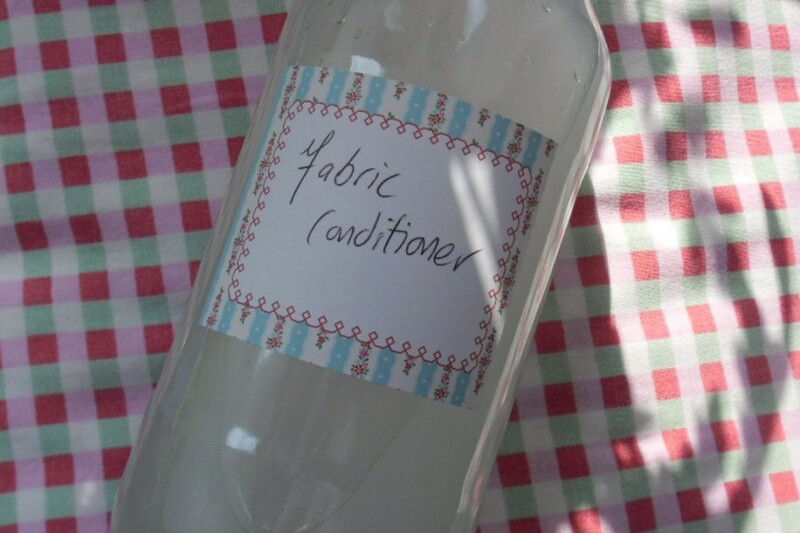 Making my own fabric conditioner could not have been easier (or cheaper!). It’s too simple for words……just a bottle of distilled vinegar (the white/clear stuff) plus 50ish drops of essential oils (I used 25 of bergamot and 25 of lavender). I liked the idea that I could have my own ‘product’ with, basically, a couple of ingredients and very little waste. The bottle is the original bottle the vinegar came in (label soaked off and my own label pasted on) and the essential oils come in glass bottles which I can recycle. The vinegar is great for keeping your washing machine tubes/parts in good order as it cuts through all the soap scum and helps keep that ‘funky’ smell at bay. My clothes come out squeaky clean and fresh…….and, no, they don’t smell like a chip shop! Give it a good shake before you pour it into your normal conditioner dispenser drawer. Trust me, it works…..and costs about 60p!